Guided tour of the archaeological and natural park on the Comacina Island. 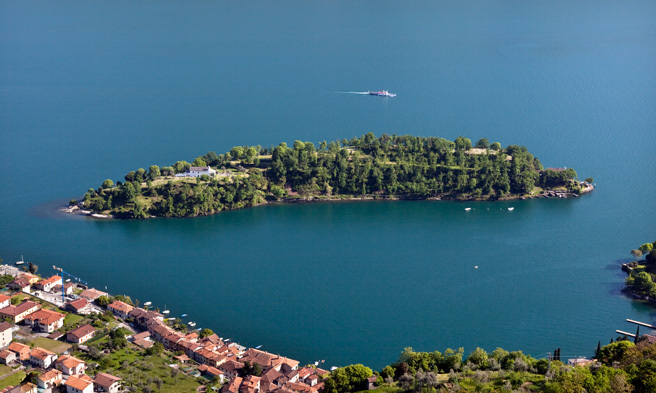 The only Island on Lake Como, was the protagonist of the local history in Roman and Medieval times, resulting in a Roman military, a political centre, and one of the most important religious centres of diocese. The magnitude of the island in history is such to make us believe That It was the mythical place from which would rise the walls of “Magistri Comacini” (ars muraria), and also the point from which would start the whole process of development of Italian medieval art.The wonderful story of Comacina seems to have stopped abruptly in 1169, which marked the ‘annus horribilis’ it’s tragic fate, devastated and razed to the ground to, Como and Barbarossa, the island declined rapidly, finishing during the following centuries in a state of neglect. Prized for its distinctive nature and splendid views, the Island Comacina regained it’s honour, since 1900, through the realisation of the three of artists houses in rationalistic style, designed to make the Island a home of fine art, and thanks to a series of archaeological excavations. Today the Comacina Island is an archaeological site whose importance transcends local boundaries, so also to place it’s Place among the most interesting archaeological sites in northern Italy in the early middle ages. After crossing the Viale del Poeta, it is possible to admire the special archaeological complex, where there’s the ancient Basilica of St. Euphemia of which remains the wonderful Romanesque crypt is the most important. Inside the church of St. John, it is possible to admire the old Romanesque church under the current floor (possibility to go below the level of the existing pavement in order to watch more closely the ancient remains). Besides the church of St. John, there’s a wonderful room with a double apse decorated by Carolingian frescoes which are well preserved and by an early Christian mosaic floor. Continuing to follow the archaeological trail, it leads to three artists’ houses, atelier realized between the years 1936-40 by the architect Pietro Lingeri in Rationalist style (based on the example of Le Corbusier)​​. Actually the three houses with such a curious architecture, that are object of study, are residences for artists of international renown, who stay on the island to take the inspiration and create extraordinary artistic works. Moreover there’s the possibility, considering also the commitments of artists, to visit their studios and to meet them personally.